Earlier, we noted that gold had held its own above a key support level and that it may be on the verge of a comeback given the recent falls in bond yields and the Fed’s U-turn on interest rates. 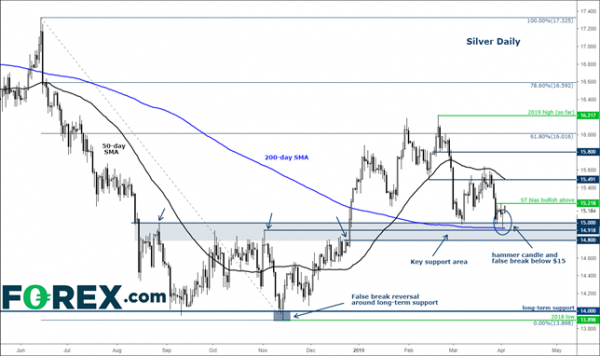 But it the other major precious metal which looks even more appealing from a technical standpoint: Silver’s dip yesterday to take out the prior lows around $15.00 was quickly rejected and the metal closed back above this key long-term support level. The resulting price action has left behind a long-legged doji/hammer candlestick pattern on the daily chart. So, not only do we have a bullish-looking daily price candle near a key support level, but we also have a potential reversal pattern in the form of a false break. That’s not to mention the fact that all of this has happened around the 200-day moving average. Given these technical considerations alone, we think that silver could be about to stage a meaningful rally. It has already shown some further bullish follow-through above yesterday’s range, which confirms that the bulls may have stepped back in. A break above the most recent high at $15.20/22 area could trigger further follow-up technical buying. That being said, any closing break back below the $15 level would invalidate our bullish view.